They derive from a hydraulic work by realized by the ancient Romans. Until 290 BC, indeed, the Velino river widened into a large area of stagnant, marshy and unhealthy water. To drain this waters, the consul Curio Dentato dug a canal that channelled towards the Marmore cliff, and from there made them fall below, with a leap of 165 meters, in the bed of the Nera river. 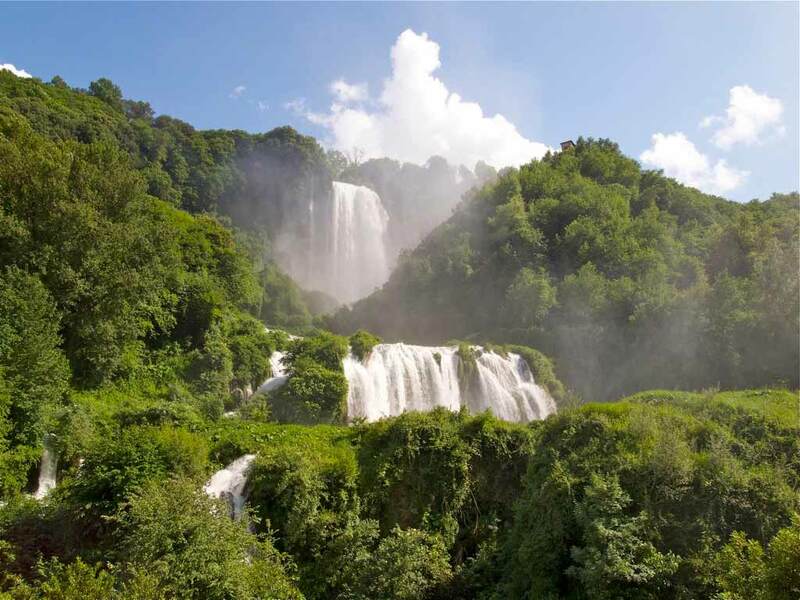 The spectacular jump of Marmore Falls has inspired poets and artists of every period of history, by Virgil in the ‘”Aeneid,” Cicero, Byron in “Childe Harold’s Pilgrimage.” Since 50 years ago the waters of the falls have been used to power the hydroelectric plant Galleto. As a result, the falls can be seen only at certain times. But under the falls and in the Nera river rafting can be practiced during most of the year.